When our homes run smoothly, we don’t question it. But when we experience power outages or central air conditioning problems, we realize just how dependent we’ve become on the mechanics of modern life. Diagnosing an air conditioning system often requires an air conditioning repair technician because there are so many variables to why your unit has stopped working or operating at peak performance. Here are a few things you can check before determining if a service call is in order. 1. Indoor blower not running. 2. Little or no cool air coming out. Check that your air filter has not become blocked with dirt and debris preventing air from coming out of the registers. 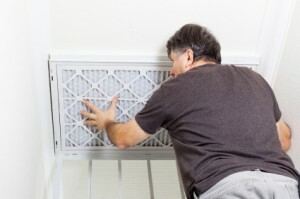 Usually the air filter is right at the air handler or blower unit, or your air filter may be installed behind a grille covering a central warm-air return that sends air back to the air handler. 3. Blower fan won’t start. If the indoor air handler blower fan itself won’t start, check for lost power. Check for a blower fan that is loose on the motor drive shaft or for a broken or lost blower fan drive belt on pulley-driven blower systems. A blocked outdoor compressor can cause the unit to overheat, stop running or become noisy and work poorly. The simplest solution, of course, is to remove the blockage, whether it’s overgrown shrubs or too close enclosure. Be sure that the service switch and the air conditioner indoor power switch, fuse or circuit break are all in the “on” position. Take a deep breath and remember that oftentimes the simplest explanation is also the most plausible explanation. If your air conditioner has stopped working, it is likely because it either has no power supporting it or something told it to stop working. Therefore, start by looking for any tripped fuses or see if someone has sneakily turned the unit off. Dirty or obstructed fan blades are oftentimes the culprit of noisy air conditioning units. See if this is the case by turning off your unit completely and checking the unit blades to ensure they are clean and unobstructed. If you do see dirt or an obstruction, follow a tip from our Spring Air Conditioner Checklist and brush away any accumulated dirt or clean the unit with light water pressure from a garden hose. Frost can build up on an air conditioner if you allow it to operate when the external temperature runs below 60 degrees. Switch your air conditioner off, and leave it off, until the frost completely melts away and the external temperature rises above 60 degrees. Keep a close eye on your unit for the next several days for a recurrence of this problem. Low air pressure followed by the release of unpleasantly warm air will oftentimes be an indication of a refrigerant leak. If you suspect a leak, the best advice we can offer is to call a professional immediately, as the leak could be anywhere in your line or unit coils. Luckily, the repair will oftentimes be as simple as soldering a leak in your line or replacing a coil, meaning you will be back up and running in no time. Most refrigeration problems in air conditioners are electrical, not mechanical. So it’s worth checking out switches and controls on an air conditioning unit before replacing more costly components. If your air conditioning system is still not working, or if the A/C system is running but cool air is not coming out of the supply registers, you probably need to call a service technician. If you need service on your air conditioning system, contact us online or call Welter Heating and Air Conditioning at 612-825-6867 for service or installation.